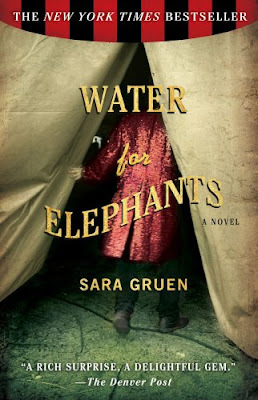 I didn't know it when I began reading Water for Elephants, but I had a ton of hangups when I turned the first page of the book I chose from your recommendations. And, those hangups had everything to do with this blog post. My husband came to me when I was about one-third of the way into the book, curled up in a chair reading, and asked me, "What do you think so far?" My response was something like this: "I think my blog readers might not like that there is a circus side show with a stripper and that there's drinking and that...."
He interrupted me, "I didn't ask you what your blog readers might think. I asked you what you think." And, I realized at that moment that I cared too much what you all might think of the book, and wasn't forming my own opinion. So, when I began reading Water for Elephants, all hangup-laden and overanalyzing, I was crippled. I simply was not allowing myself to think my own thoughts. I was trying to guess yours. But, after that conversation with my husband, I forgot about you. I allowed myself to get lost in the story. I let go of this blog and this silly review. I let myself freely enjoy reading the story. And, I absolutely loved it - reading just for the enjoyment of reading, the hours I spent curled up in my favorite leather chair at night, and the story that captivated me from the second page on. I loved the conflict and the characters and I was fascinated by the early 20th century circus culture. I loved that I was hooked, that I had to use toothpicks to keep my eyes open at night to read "just one more page", and that when I finished, I wanted to read more. There were some things that made me a bit uncomfortable - two scenes in particular. But, when I finished the book, they didn't matter to me. I can't really remember them in detail now. So, as I took a leap into the world of reading for pleasure, I learned something about myself. I need to read for me. If I'm going to learn to love reading, which I so desperately want to do, then I need to not feel the pressure of a book review. Or of an imaginary blog audience peering over my shoulder. I'm going to keep reading. I'm reading a new book now - and I am lost, again. This time in Bahrain, Iraq. Maybe I'll share it with you when I finish. No need to share your books, just read, read, read! It is wonderful to get lost in a book... a romance, a war, a cattle roundup, oh, the possibilities! Thanks for the review. I've heard this book is good, and if you liked it, that's good enough for me! What caught my attention was how old people are treated. It broke my heart. I wondered how I could have done better for my dad. If only . . . I am thankful that my dad's nursing home stay was short but even so it was too long. I am do glad you liked it! I agree there were some uncomfortable things but I loved that it was real and human with out the pretense of innocence for social niceties that old age can sometimes bring. i'm glad you read a book (any book). I'm glad you found a way to read it for your own pleasure because that's what reading is all about. and i'm really glad you liked this book. if you hadn't liked it, you would be more hesitant to start another one. enjoy this next one. enjoy the escape one finds between the pages of a good book. I was sad when I came to the end of Water for Elephants, because I had come to love the characters so much. The best book I've ever read was The Story of Edgar Sawtelle. It took me a while to start it because the thickness of the book was daunting, but once I started, I read it in a week. I was definitely propping my eyes open with toothpicks! It was utterly spellbinding. I was in tears after I read the last page, because I was heartbroken that it was over and I wouldn't be able to read it for the first time ever again. I just kept saying, "Wow" over and over. Highly, highly recommend that one. I thought the exact same thing, Sar! Glad you liked it, too...and glad you're hooked on reading now, hopefully :) I tried Memoirs of a Geisha a few months back; although it's not based on fact (I think some ppl insinuate that), it's really good. Never saw the movie but I'm sure the book's better. You should try it :) Anyway, I'm sure you have lots of rec.s living with a reader; just glad you realized what you were missing :) haha...love you! Thanks for the recommendation. I am always looking for a good book, although I don't get much time to read. I am going to read this book when I finish my current one. Since you gave a recommendation, I will give you one. Right now I am reading William Goldman's "The Princess Bride" and it is so much fun. I highly recommend it. Am I really reading a book review HERE?!? Just kidding. If you choose to share your opinions, I am sure I would love to read them on any books you may read in the future. I'll add this one to my list.